This blog was written by Jane Werry, Director of Music at Hayes School. As music teachers, we have a lot of things that set us apart from teachers of other subjects. Our subject is invisible, and exists only in real time – it can’t be put into a book, or written on. Music involves a huge variety of skills and knowledge, which makes teaching it a fascinating but complex business. 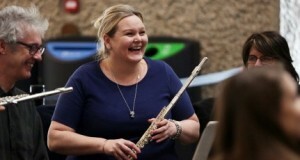 Music teachers are often expected to put on a whole host of extra-curricular activities, which act as a shop window for the school, on top of teaching huge numbers of students. Sometimes they have to contend with senior leaders who want them to do things in the same ways that other subjects do. Many music teachers have to fight for timetable time, rooms, funds, or the very existence of music in their school. And often they do this alone, in a department of one. A sense of isolation – even in schools where there is more than one music teacher – can lead music departments to feel as though they are constantly reinventing the wheel. Just to know that others are dealing with the same things offers some solace, but to be able to share ideas and experiences directly is a lifeline. This is where Music Excellence London comes in. Bringing together the excellent work already done by the Peer to Peer and Teach Through Music programmes, it provides a channel of communication for music teachers, so that ideas can be shared and classrooms can benefit. The team of Teacher Advocates from all over London will be at the centre of providing peer to peer support, hosting webinars and TeachMeets, and contributing to our online community. Teacher Advocates do not pretend to have all the answers, but are practising London music teachers facing the same challenges as everyone else. We know that there are great ideas and opportunities out there, and knowing about them can only help music teachers with their teaching and in their working lives. For myself, I am excited about the prospect of music-specific TeachMeets and webinars as forums for sharing ideas and learning new things. Whether these are ideas that I can try out in my own classroom the next day, something that will help me run my department better, or stick up for music in my school, sharing them can only be a good thing, whether this is face to face or via online forums. They might be great ideas for a scheme of work, a lesson activity, a way of teaching something, or something much more prosaic like a fundraising idea or storage solution. I, for one, am excited about the prospect of learning new things that will be of benefit to me, my students, and music in my school.